Ryzen's 40 percent improvement in instructions per clock turns out to be conservative. Ryzen is here. AMD said Wednesday that it plans a “hard launch” of its first three Ryzen processors on March 2. The highly anticipated chips promise to outperform high-end parts from Intel and undercut their prices by as much as 54 percent. AMD executives confidently unveiled the first three desktop chips to attack Intel’s Core i7, supported by several top-tier motherboard vendors and boutique system builders. In many cases, executives said, AMD will offer more for less, as early Ryzen benchmarks prove. The top-tier Ryzen 7 1800X will cost less than half of what Intel’s thousand-dollar Core i7-6900K chip does—and outperform it, too. You can preorder Ryzen chips and systems from 180 retailers and system integrators today. Like Intel, AMD’s Ryzen offerings consist of three new chip families: the premium Ryzen 7, the midrange Ryzen 5, and the cheapest Ryzen 3. 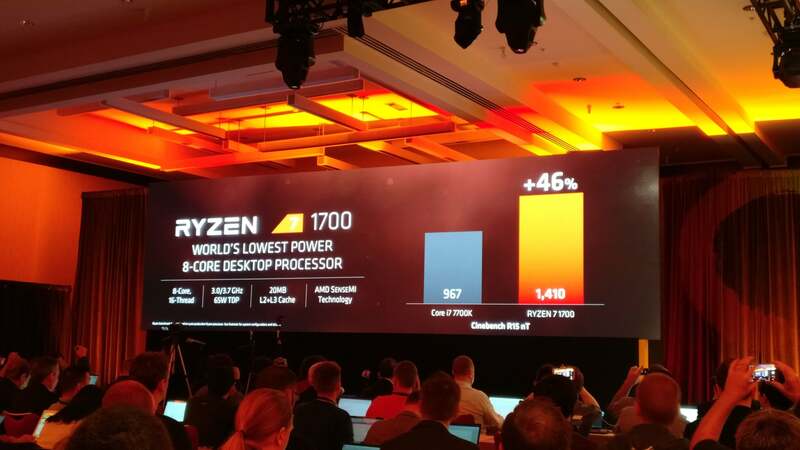 AMD is rolling out its fastest, premium Ryzen 7 chips first, including the Ryzen 7 1800X ($499), the Ryzen 7 1700X ($399) and Ryzen 7 1700 ($329). AMD’s Ryzen 5 and the Ryzen 3 will ship later this year—at the moment, AMD’s not saying exactly when. Why this matters: About the only major aspect of Ryzen that AMD hadn’t yet disclosed was its price and availability. Analysts say AMD appears to have done its homework, leaving Intel in danger of giving up market share in the bread-and-butter PC microprocessors that built its company. But Intel has its ways: Possible responses include price cuts, additional chips with more cores, and promoting its new Optane technology, they said. 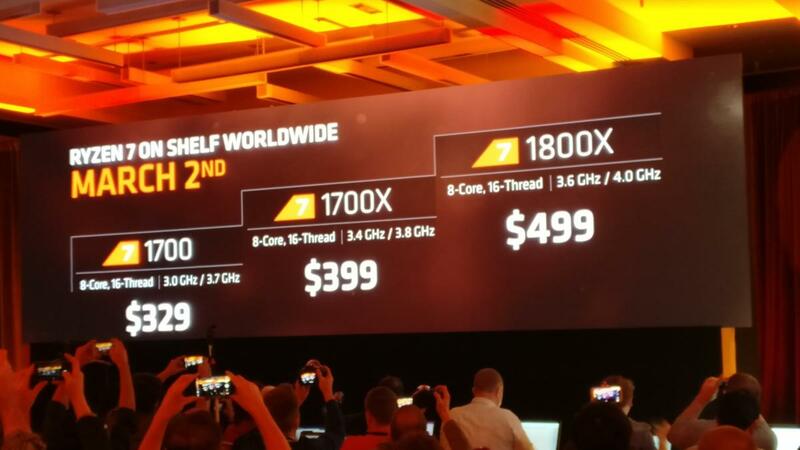 AMD will begin taking preorders for the Ryzen today for shipment next week. AMD’s Ryzen 7 1800X, a 95-watt part, boasts 8 cores and 16 threads. It runs at 3.6GHz and will boost to 4GHz, AMD chief executive Lisa Su said. When AMD’s $499 chip matched up against the eight-core Intel Core i7-6900K—a $1,089 part—the 1800X recorded an identical single-thread score of 162 on the Cinebench benchmark. But when all of its cores were turned on, the 1800X outperformed the 6900K by 9 percent, recording a score of 1,601. 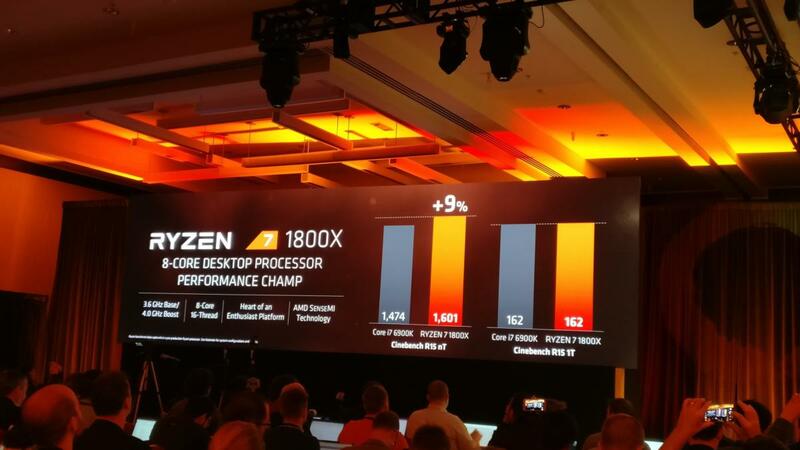 The 1800X “is the fastest eight-core processor on the market,” Su said. AMD’s Ryzen 7 1800X is the “fastest 8-core processor in the market today,” AMD’s Lisa Su said. AMD’s Ryzen 7 1700X, a 95-watt, 8-core, 16-thread chip, runs at 3.4GHz and boosts to 3.8GHz. Using the multicore Cinebench benchmark, the $399 1700X scored 1,537, 4 percent faster than the $1,089 Core i7 6900K chip. AMD’s Ryzen 7 1700X is aimed at gamers and content creators, according to AMD. AMD’s Ryzen 7 1700, consumes up to 65 watts and runs at 3GHz, boosting to 3.7GHz. It, too, includes 8 cores and 16 threads. According to AMD’s own tests, it recorded a score of 1,410 on the multicore Cinebench test, a whopping 46 percent better than the $339 Core i7 7700K. Using the Handbrake video-encoding test, the R7 1700 finished in 61.8 seconds, AMD said, versus 71.8 seconds for the 7700K. Though the cheapest Ryzen 7 AMD announced, the 1700 still packs a punch. According to AMD, the Ryzen 1700 will be packaged with a new Wraith Spire cooler, which will run at 32 decibels. (The other two Ryzen chips will not.) AMD also confirmed the Wraith Stealth cooler, too. 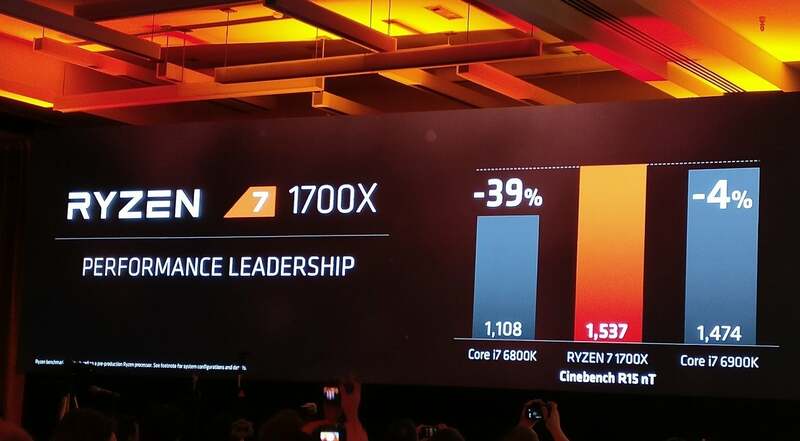 Ryzen’s apparently strong performance is due to an overachieving design team. (For more on AMD’s Zen architecture and its features, see our earlier story.) AMD said early on that one of its goals was to increase Zen’s instructions per clock (IPC)—a measure of its performance efficiency—by 40 percent. In fact, Su said, AMD achieved a 52 percent IPC improvement. “We not only beat our goal, we beat it by a lot,” Su said. All three chips will be supported by motherboards from ASRock, Asus, Biostar, Gigabyte, and MSI—82 different boards in all, AMD said. They'll be based on the AM4 platform, and AMD's X370 and B350 chipsets. 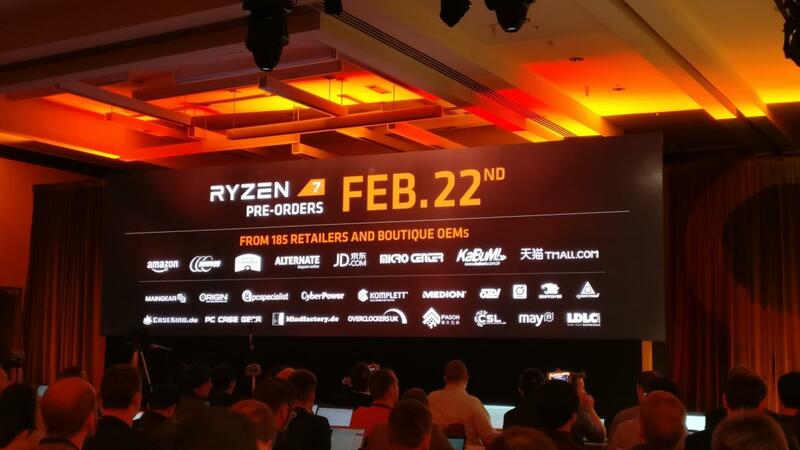 At launch, 19 “elite builders,” per AMD, are expected to debut Ryzen systems, with a total of 200 expected during the first quarter. PC towers designed for gaming from top hardware makers are also coming during the same period, AMD said. Next up: Radeon Vega, AMD’s next-gen PC graphics solution, scheduled to launch in the second quarter. Su reiterated that she believes AMD will have adequate supplies of Ryzen on hand to meet customer demand, a claim that Moor Insights analyst Pat Moorhead says he’s confirmed. AMD believes that Intel’s rested on its laurels, delivering a series of minor improvements year in and year out. To its credit, however, Intel has maintained operating profits even as it negotiates a gradual shift away from a shrinking PC market by prioritizing profitable high-end PC processors. With Ryzen, AMD sees an opportunity to steal some of that high-margin share. Intel, however, has several opportunities to respond, including simply lowering its prices. Intel’s latest official processor price list remains unchanged since early January. Still, as Moor Insight's Moorhead pointed out, AMD has a lot more to lose than Intel has to gain by a price move. What does Intel have up its sleeve? “The way that I think [Intel will] react is to say, ‘let’s see if this is for real,’ and determine what Ryzen’s performance actually is,” Moorhead said. “But they might have two or three things in the hopper,” he added, including pushing single-threaded chips like the Core i3, and adding additional cores to its existing lineup. The third option is Optane, Intel’s super-speedy storage technology, which Intel could use to pooh-pooh CPU performance and push system-level improvements. Adding cores seems most likely, however. With the exception of the 6900K—as well as its eight- and ten-core Extreme Edition chips—Intel’s Core i7 chips top out at six cores, compared to eight for AMD’s Ryzen. “AMD has a core advantage, and eventually I am expecting AMD to layer in cores,” Moorhead said. Until Ryzen chips become available for benchmarking, we won’t know for sure how well the Ryzen will compete. For now, though, anticipation is running high. 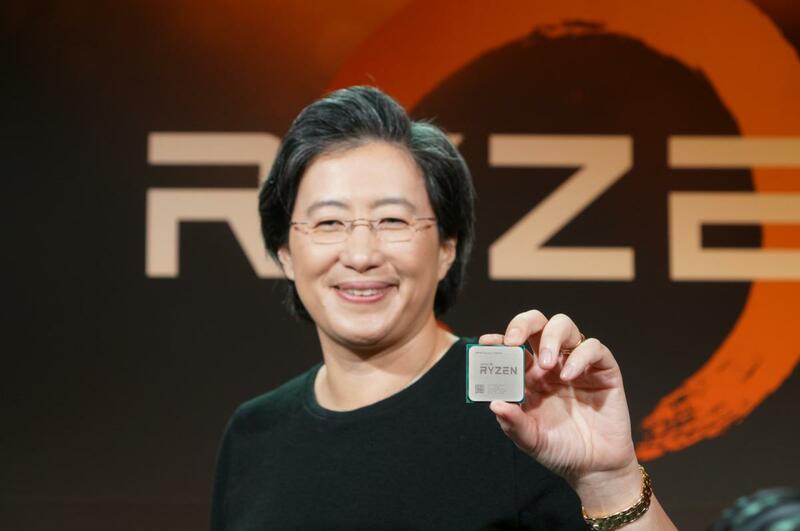 A closeup shot of AMD CEO Lisa Su holding the Ryzen processor. 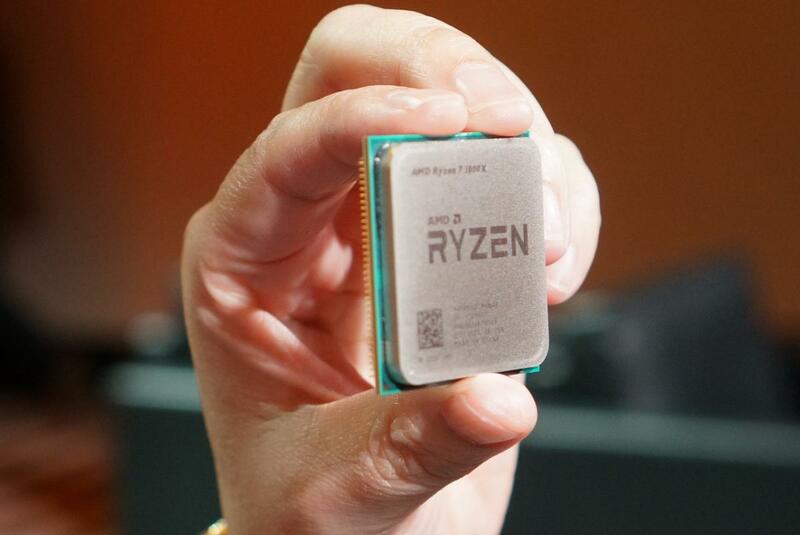 Nathan Brookwood, an analyst with Insight 64, said Ryzen is “clearly the most competitive chip they’ve fielded in a decade,” a statement that Moor Insight's Moorhead, an AMD veteran, echoed. Gartner analyst Martin Reynolds noted that AMD has extended the single-core performance that Intel itself offers over eight cores, with high-memory bandwidth to boot. AMD’s Su had a simpler take: “The best starts now,” she said. Updated at 10:07 AM with additional details.